Did the Seventies Really Happen? I sometimes wonder. I just got another trove of old Newsdays, and I always feel stupid for buying them until I get them. Once I pore over them, I am fascinated and amused for hours. It's all so familiar, and yet so... different. Remember in-store promotions? 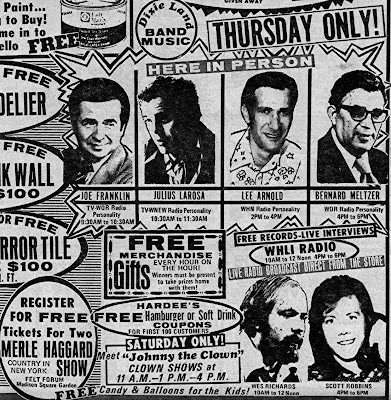 Yeah, I guess they're still around, but good luck finding a paint store these days where you could stand around and kibitz with the likes of Joe Franklin, Bernard Meltzer, and Johnny the Clown. 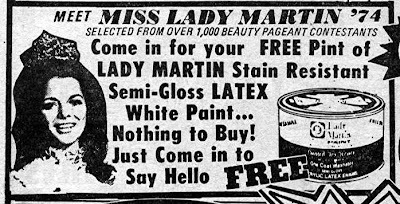 From that same ad, Miss Lady Martin 1974. Semi-gloss? You bet. Stain resistant? I'd like to find out! Speaking of beauty queens... well, I guess she's not a queen so much as a random girl in a bikini handing a trophy to a carpet salesman. Wonder if she took any Flack later that night--Hey-yo!